Maintaining good posture... why bother? What is good and bad posture when sitting? 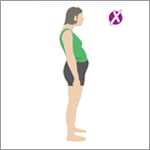 What is good and bad posture when standing? What is good and bad posture when lying? This page is one of a series all about understanding and improving your posture Here we look at how to spot good and bad posture. Most people have to work at keeping a good posture whether they have MS or not. 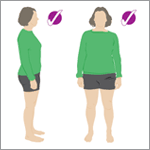 If you have MS, you might find that muscle weakness, pain or fatigue makes keeping a good posture challenging. Poor posture can develop gradually, often without you noticing, until it interferes with every day tasks or causes pain. It can then make other MS symptoms worse or harder to deal with. Simple changes in posture can be beneficial and these can be incorporated into everyday activities. Changes are best done gradually and practised little and often. It is not always that easy to know if you are doing it correctly, so if any of the suggestions in these pages make your symptoms worse, you should stop and consult a therapist. 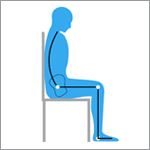 If we sit, stand or lie in a poor posture for any length of time, it puts stress on the muscles, joints and ligaments. This can cause pain and damage, for example back, neck and shoulder ache. This can make your MS symptoms worse or harder to deal with. Fortunately, the reverse is also true. 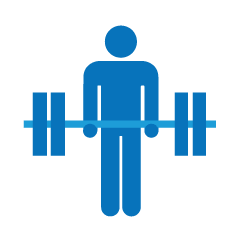 Improving your posture and strengthening your muscles can reduce the burden of some MS symptoms. 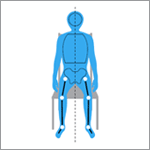 A good posture uses less energy - whether this is maintained by your muscles or by sitting in a supportive chair. Your core muscles in your abdomen work more efficiently if they are correctly aligned, which means they can support you and allow you to move your limbs more freely. If your body is comfortable, you are saving your energy for the movements you want to make. Good posture can therefore help with muscle weakness, pain and fatigue as well as ataxia (coordination problems), tremor, spasticity and spasms. 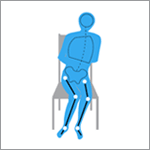 Good posture is especially important if you cannot move your body by yourself. Try to ensure you are assisted to a well-aligned position. None of us can maintain this correct upright posture unsupported for long periods of time, so it is important that the furniture you are sitting on supports your spinal curves, be that at your desk, in your car or on the sofa at home. As you are reading this, sit well back in the seat, feet flat on the floor. 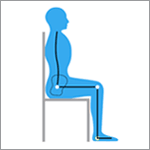 As when you are sitting and standing, you are aiming to keep the 'spine in line' when lying down. 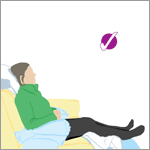 The role of the mattress and pillows is to help support the natural curves in your spine. When lying on your back, try and lie symmetrically rather than with a twisted pelvis or with your legs to one side. If your legs don't naturally stay straight when you are on your back, due to spasms and tend to twist to one side, try pillow(s) under your knees to keep them in line with your spine. Avoid too many pillows under your head when lying on your back or side, as this can push your head up straining muscles and joints in your neck. Ideally your pillow should only be under your head, not under the shoulder as well. 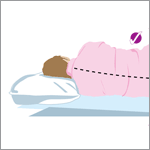 The pillow should fill the gap between your head and shoulder, keeping your head in line with your spine. This creates the least amount of strain. 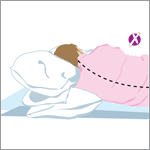 When sleeping, avoid lying on your front as it is impossible to keep your 'spine in line' in this position and may well cause neck pain as your head is permanently turned to one side. Also be careful if lying on the sofa as this potentially could put your spine under quite a lot of strain and hence cause pain after a while if you are not supported in this position. If you want to sit with your feet up, try and support yourself as much as possible with your 'spine in line' to keep it in a good posture. 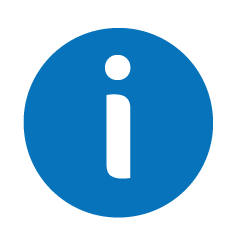 Whatever position you are in, it is always wise to change your position regularly (at least every 20 minutes) to minimise any problems from being in one position for too long.